The Hike: The start of the trail is marked on the map with the waypoint labeled "Trail Head". Here you'll find a large sign with a map of the entire Greenbelt. The trails starts off by heading south west then west under MoPac and Hwy 360. The going here is fairly easy. As you can see from the topo map, it's fairly dated. It does not show MoPac South crossing Barton Creek. Trust us, it does. The next waypoint on the trail is actually something that we explored on our way back to the start. There is a very rocky stream bed that leads into a small valley with a beautiful rockfall crevice on the face of the sheer wall to the right. 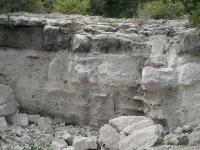 It looks like layers of rock just collapsed and created a slanted ledge on which to perch. Unfortunately that spot was taken by a couple of other hikers when we passed by, so we'll have to revisit some other time. The trail is fairly easy to navigate, with the exception of a few areas, including the very narrow foothold that includes a chain drilled into the rock to add extra support. It's not too scary though. We saw kids go by there and dogs just ran across like there was no danger at all. 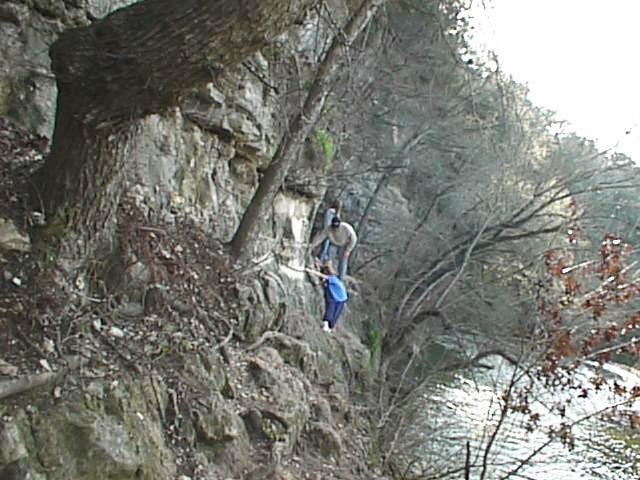 The main upper Barton Creek trail crosses the creek at Twin Falls. This is a popular gathering place for folks hitting the trail from either direction, so it can get rather crowded on nice days, as you can see from our photo. 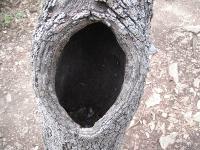 Nevertheless, it's a fine place to take a rest and have a snack. If you work your way a little downstream you can find a few nice rocks to sit on and listen to the water. Most folks seem to be interested in getting their feet wet at the falls themselves. On our trip this day we decided to stay on this side of the creek and take the less travelled route that we were told led to some springs. So we continued and came to a water rapids we've marked as "Bank Falls" on the map. More rapids than falls the area is notable for being much less crowded than Twin Falls. 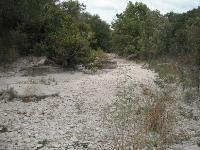 It also includes a relatively wide bank of well rounded stones and even a small grassy bank. If you'd like to listen to water rapids but not hear as many people, this might be a good place to go. The waypoint marked cave is really just an impression in the rock face. But, it makes for a fine place to stop and eat, which we did. The rock layers provide natural seating and you get a good view of everyone on the trail. 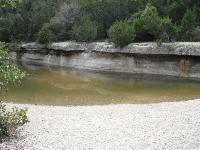 The trail crossed several streams that feed into Barton Creek. But none of them seem as interesting to us as the stream marked with "Slant Rock". 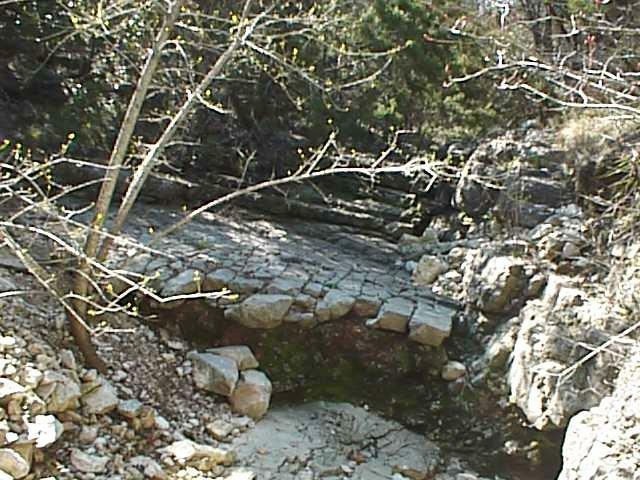 This stream bed is composed of layers of rock that angled relative to overall ground and the light layer of rock is held up by a darker layer. As the light layered rock cracks it gives the distinct impression of a concrete slab breaking up. The waypoint marked "Spring" is the first of four springs that we found on this day. But you'll be rewarded with a nicer set of springs if you continue onward. When you get to "Twin Springs" you've reached the highlight of the hike. 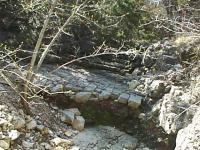 Two springs sprout about 5 feet apart and join in a small stream leading to the creek. The area immediately around the spring streams is teaming with small green plants. At this point, you're close to the end of the trail. 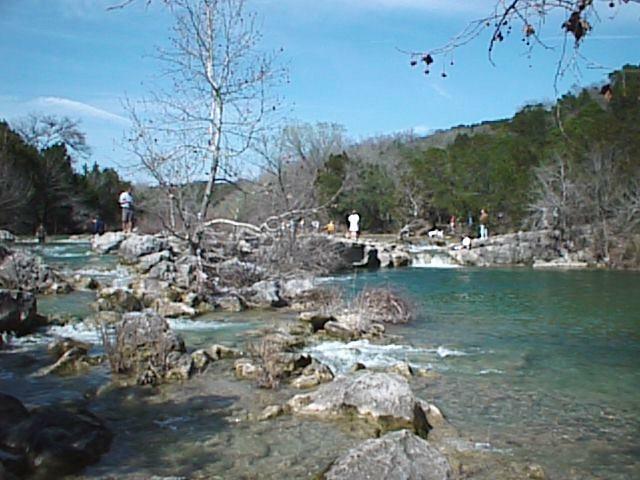 Near the end you'll come across another spring, though we could not see it so much as hear it and see the stream of water working it's way to Barton Creek. The trail really starts to narrow and very soon will end in foliage. Time to turn back. On the way back we spent a little time picking up trash that others left behind. In the end we collected a grocery bag full without exerting too much effort. As always, take all of your trash with you when hiking, but also take a little time to pick up a little extra. If we all did that we'd see no trash on the trails. 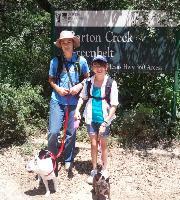 Nice, easy, day hike w/kids and dogs. Took my children and dogs on a nice close by hike. Trail was nice and not difficult but still interesting. We went for the hike but will plan on more water activities on our next visit. parked at Best Buy and walked down to the creek. Beautiful day and the water is flowing. 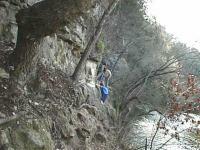 Hiked to the springs at the end of the southern "shore" of Barton Creek with Madden Maniac. Not much of a shore without any water other than the small springs there. The trail is fairly dusty, but it was still nice to get outside and the weather is definately cooler now. Encountered more cyclists than hikers, but generally had pleasant interactions with all. this hike was fun to do with friends. clearly, many people come here on the weekends with their families and friends to swim and enjoy the creek. this is one of my favorite bits of the greenbelt. i love the part with the chain! although i swear i remembered that section as more treacherous than it appeared today. oh well. met a lost runner and hopefully helped direct her back to where she started. inspired by this encounter, i now carry small (4x6") maps of the trail to hand out in case i meet more lost people in the future. i think i can explain it better on paper than by waving my arms around and saying "360 that way! mopac that way!" i still need to complete the rest of the south side on a future hike. We followed the recommendation and its is a really nice trail in the chain crossing area (which is not even narrow as it looks in the pic) but after Mopac is fairly average, not close to the creek in most places, and it just dead ends in sight of sculpture falls. Would be nice if you can cross to the north at Twin Falls and take the north side to Sculpture Falls and beyond. We took a side trail that we thought looped around and it came out in Travis Country. Still 3 stars but there are much nicer hikes on Barton Creek. Mural under 360 is beautiful. Just kind of stumbled upon it... very cool.